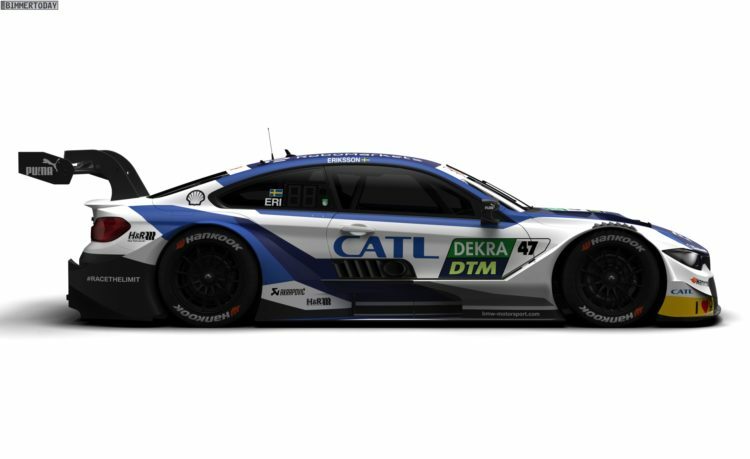 With CATL, BMW Motorsport has won another new premium sponsor for the DTM 2019. The Chinese battery giant will be the prominent namesake of the white-and-blue CATL BMW M4 DTM, which Joel Eriksson will be piloting next season. The lettering can be clearly seen, among other things, at the doors and at the rear of the M4. We can also assume that there is no logo on the bonnet, even without suitable pictorial material. CATL was previously represented as an Official Partner in the BMW factory-supported customer sport and can be seen on the BMW M8 GTE. With the new partnership in the DTM, the Chinese are even more prominent and certainly want to increase their awareness in Germany – the country in the midst of which the company is currently building a huge battery factory, which will supply, among other things, the batteries for the BMW iNext. In recent weeks, a few of the other M4 DTM designs have already been revealed in 2019. In addition to the familiar look of the matte black BMW Bank M4 DTM for Bruno Spengler, Schaeffler and ZF also introduced two new premium sponsors. Jens Marquardt (BMW Motorsport Director): "In CATL we have won another committed premium partner for the DTM. It is always great when a cooperation can be continuously developed and expanded over the years. This has been the case with CATL over the past few seasons. Now we want to celebrate success together in this new form of partnership. " Matthias Zentgraf (European President CATL): "CATL is a strong partner for the automotive industry. So I am particularly pleased that we can send CATL's messages to Joel Eriksson this season. As a new premium partner of BMW M Motorsport in the DTM, we want to deepen our partnership with BMW and enjoy success together. " Joel Eriksson: "I am delighted to be racing with CATL as premium partner in the DTM this season. It's my second year in the DTM and I've planned a lot for this. I hope to be able to compete with CATL as often as possible for the front rankings and will give everything. "